Thermal spray processes are widely used in the industry today for application of coatings for resistance to wear, environmental attack, temperature and bio-implants. The popularity of thermal spray processes is on the rise with a lot of new applications coming up in the automobile and aerospace industry along with heavy industries. In addition to this, research in the development of special coatings with tailor-made properties for different applications is being carried out extensively in research organizations and academic institutions. There is a lack of knowledge of what are the thermal spraying techniques including recent techniques that are available to an engineer and what can he do with them in our country. There is an necessity of programs that can disseminate information on the techniques available and the practical applications of it. Not all techniques will work for all applications. Certain techniques work well for ceramics while certain work well for metals and alloys. It is necessary to understand the process and its characteristics and its advantages and limitations. This will be necessary for choosing a particular process for a particular application. 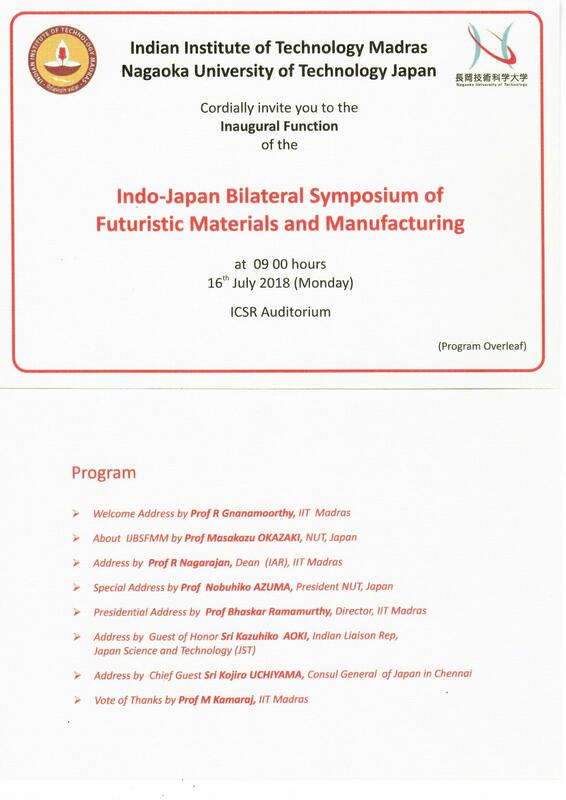 The idea of the workshop originated from Indo–‐Japan Bilateral Symposium to be held on 16–‐17 July 2018, IIT Madras. Eminent speakers from Japan and India will cover the various aspects including Fundamental, processes and applications.